Sarcopenic obesity (SO) is characterized by the disproportion between the amount of lean mass and fat mass, ie, the discrepancy between engine and the mass to be moved.1 Apart from this functional aspect, the synergistic negative effect of skeletal muscle and adipose tissue inflammation,2 which characterizes this “geriatric syndrome,”3 has severe cardiometabolic implications4 that are highly relevant for morbidity and mortality of older people.1,5 Resistance exercise favorably affects both, muscle mass6 and fat mass7 in older adults; thus, it should be quite an effective tool for preventing or treating sarcopenia and SO.8 However, only a minority of people9,10 achieve the exercise doses recommended for positively impacting muscle mass, disabling conditions or obesity.11 Frequent reasons given for absence from exercise are time constraints, physical limitations or little enthusiasm for exercise conducted alone.12,13 Hence, innovative, time-efficient, joint-friendly and highly individualized exercise technologies, foremost whole-body electromyostimulation (WB-EMS), may be a good choice for older subjects at risk for sarcopenia or SO. Besides exercise, protein supplementation may favorably address sarcopenia and SO in older people.14,15 Most promising, a combined therapy with WB-EMS and additional protein intake should be an appropriate low-threshold/non-pharmacologic intervention and transferable even to physically limited older persons with low enthusiasm for exercise. The aim of this study was to determine the effect of a combined WB-EMS and (whey) protein vs an isolated whey protein supplementation vs a noninterventional control on sarcopenia and SO in community-dwelling men aged 70 years and older with (morphometric) SO. Our primary hypothesis was, that WB-EMS and whey protein (WB-EMS&P), but not isolated whey protein supplementation (Protein) significantly affects sarcopenia (ie, Sarcopenia Z-Score) compared with a non-training non-protein supplemented control group (CG). Our secondary hypothesis was that WB-EMS&P and isolated protein supplementation significantly affected obesity (specified as “total body fat rate”) compared with a non-training, nonprotein-supplemented control. Our third hypothesis was that WB-EMS&P and isolated protein supplementation significantly affected skeletal muscle mass compared with a non-training, nonprotein-supplemented control. The Franconian (Franconia is the northern part of Bavaria) Sarcopenic Obesity (FranSO) study focused on two main aims: 1) to determine the prevalence of sarcopenia and SO in community-dwelling (CDW) older men and 2) to determine the effects of two interventions: a) WB-EMS&P and b) isolated protein supplementation (protein); vs an untreated CG on sarcopenia and SO in this cohort. FranSO is a randomized controlled trial with a parallel group design with the three balanced (1–1–1) study arms listed earlier. The study was planned, implemented and conducted between February and December 2016 by the Institute of Medical Physics (IMP). The IMP was supported by the Institute of Biomedicine of Aging, both part of the University of Erlangen-Nürnberg (FAU), Germany. The University Ethics Committee of the FAU (Ethikantrag 67_15b) approved the FranSO study in April 2015. The study complied with the Declaration of Helsinki’s “Ethical Principles for Medical Research Involving Human Subjects.” After detailed information, all the study participants gave their written informed consent. The project was registered under ClinicalTrials.gov: NCT2857660. During the screening process, about 6,800 men aged 70 years and older living independently in the area of Erlangen–Nürnberg, Germany, were contacted by personal letters using citizen registers provided by the municipality.16 Of importance, the letters already included some eligibility criteria (ie, age and independency). A total of 1,045 persons replied to the letters and were further contacted to check for more specified eligibility criteria (ie, contraindications for assessments) by phone calls and structured interviews. Following our eligibility criteria for the screening assessment, we included 1) men, 70 years and older, 2) living independently at home and 3) able to visit our laboratory, and we excluded men with 1) total or partial amputation of the limbs and 2) contraindication for bio-impedance analysis (BIA) assessment (eg, cardiac pacemaker); accordingly, altogether 965 subjects of Caucasian race were screened. Proceeding with the interventional part of FranSO, only 25 of these 31 eligible men agreed to participate in the project. Therefore, we had to relax our sarcopenia criteria and focus on morphometric sarcopenia alone (ie, without dyna[mo]penic or functional aspects). We applied the skeletal muscle mass index (SMI) cutoff point of <0.789 suggested by the FNIH17 for sarcopenia and the cutoff >27% body fat for obesity recommended by Baumgartner.20 Implementing these cutoffs, 137 men fell within our diagnostic criteria of SO. Due to the trial exclusion criteria, 1) use of medication (eg, glucocorticoids) or diseases (eg, Cushing syndrome) affecting muscle mass or preventing WB-EMS application (eg, cardiac pacemaker): n=11, 2) resistance-trained status (>45 min/week of any type of resistance exercise): n=4, 3) more than 2 weeks of absence during the interventional period: n=5 and 4) regular high alcohol abuse (>80 g/day on 5 days/week; eg, >4×0.5 L/day beer with volume 4.8%): n=2, finally, 115 men were eligible to participate in the trial. A total of 15 men refused to participate; however, six of them reported the inability to join the preferred study group due the randomization process as the reason for their withdrawal. Correspondingly, 100 participants were allocated randomly and balanced (details are given in the following sections to three study groups: 1) WB-EMS&P and 2) isolated protein supplementation (Protein) and 3) untreated CG). Figure 1 shows the flowchart of the interventional part of the trial. Figure 1 Diagram of participant flow through the different study phases. Abbreviations: EMS, electromyostimulation; FU, follow-up; ITT, intention to treat; WB-EMS&P, whole-body EMS and protein supplementation. We used WB-EMS equipment (miha bodytec®, Gersthofen, Germany) that enables us to simultaneously stimulate thighs and upper arms, hip/bottom, abdomen, chest, lower back and upper back with an overall area of stimulation of about 2,600 cm2 (Figure 2). Of importance, the system allows a selectable and thus dedicated intensity for each of the regions. In the current study, we applied a consistently supervised, video-guided WB-EMS program in a standing position 1.5 times per week (eg, each Monday and every second Thursday) for 16 weeks. We applied bipolar electric current with a frequency of 85 Hz and an impulse width of 350 μs and used an interval approach with 4 s of electromyostimulation using a direct impulse boost and 4 s of rest. Of importance, low-intensity movements or exercises were conducted during the 4-s stimulation period.21,22 The duration of the session was progressively increased from 14 min to 20 min after 4 weeks. Figure 2 WB-EMS equipment with operator device and electrodes (vest, arm-, leg-, gluteal-cuffs). Due to regional and individual variations in current sensitivity, we used a rate of perceived exertion (RPE) to generate a sufficient but tolerable intensity of the EMS application. Participants were encouraged by the instructors to exercise at an RPE of “6–7” (ie, hard+ to very hard) on the Borg CR10 Scale.23 In detail, (current) intensity was individually adapted for each body region in close interaction with the participant during the second session and then again after 4, 8 and 12 weeks. The settings were saved to generate a fast, reliable and valid setting in the subsequent sessions. Based on these initial settings, instructors slightly increased (current) intensity every 3 min in close cooperation with the participants to maintain/slightly increase the prescribed RPE during the session. Based on a 4-day dietary protocol completed by all study participants (details are given in the following paragraphs), the WB-EMS&P and protein groups were supplemented with whey protein powder (Inkospor Active; Inkospor, Roth, Germany) to achieve a daily total protein intake of 1.7–1.8 g/kg per day body mass. The chemical score of this product is 159; 100 g/day represented a caloric value of 1,526 kJ (360 kcal) and contained 80 g of (whey) protein with a high L-leucine (9 g) and essential amino acid (EAA; 57 g) component. Further, the supplement contains 2.8% of fat and 6.4% of carbohydrates (CHO). Participants were asked to take the protein powder with water, doses of more than 40 g had to be split; however, we did not focus on an intake at a specific time of the day. During a corresponding meeting, all participants were instructed in detail how to take the protein supplementation; participants were also regularly interviewed about and encouraged to maintain their protein intake habits during the WB-EMS sessions. All participants were provided with cholecalciferol (Taxofit, Cologne, Germany) and were requested to take a daily dose of 800 IU. FNIH17-based Sarcopenia Z-Score at baseline and after 16 weeks of intervention. Handgrip strength at baseline and after 16 weeks of intervention. Tests were conducted at baseline and after 16 weeks consistently by the same method and research assistant at the same time of day (±1 h). Of importance, we did not use the screening data as the baseline data but conducted new assessments for all primary and secondary outcomes immediately prior to the intervention. Handgrip strength of the dominant hand was tested using a Jamar hand dynamometer (Sammons Preston Inc., Bolingbrook, IL, USA). The dynamometer grip width was adjusted individually to participant hand size. Tests were performed in an upright standing position, arms down by the side. The standardized instruction to the participants was consistently “squeeze as strongly as possible.” Two tests intermitted by 20 s of rest were performed for the dominant hand, and the higher result was included in the analysis. Demographic parameters (eg, family/educational status and occupational career), diseases (indication, duration, severity), medication (type, dose, duration), operations (eg, hip, knee and shoulder total endoprosthesis), physical limitations, injuries or falls within the last year, low-traumatic fractures, pain severity and frequency at different skeletal sites and lifestyle with special emphasis on physical activity, exercise and nutrition24 were determined using a standardized questionnaire completed by the participants while visiting our laboratory. In addition, we used the abridged version of the Late Life Function and Disability Instrument (LLFDI).25 Research assistants carefully checked the completeness and accuracy of the questionnaire together with the participants. During this interaction, the degree of independence and autonomy, family status, social network and use of ambulatory nursing services were ascertained in more detail. After careful briefing and instructions, the participants’ dietary intake was assessed immediately before and after the trial by 4-day dietary protocols conducted by all participants. The consumed food was analyzed using the Freiburger Nutrition Protocol (Nutri-Science, Hausach, Germany). In case of dubious results (ie, energy consumption <1,000 or >3,500 kcal/day), participants were interviewed, briefed and asked to properly complete another dietary protocol based on more representative days. No changes of trial outcomes were conducted after trial commencement. In contrast to recognized sarcopenia definitions,17,18,26,27 we focused on the morphometric aspect of sarcopenia only. We used appendicular skeletal muscle mass (ASMM)/BMI approach17 to calculate the SMI. In detail, men with an ASMM/BMI of <0.789 were classified as sarcopenic without further applying a functional criterion (ie, grip strength <26 kg). Obesity was diagnosed using the body fat rate instead of BMI since the latter criterion is obviously inappropriate in the context of SO. According to Baumgartner,20 we applied a cutoff point of >27% body fat to diagnose obesity. To avoid multiple testing, we summarized the two sarcopenia criteria (SMI and handgrip strength) suggested by the FNIH17 in one single factor. Using the individual participant’s data, the FNIH sarcopenia cutoff values for handgrip strength (26 kg) and SMI (0.789) listed earlier and the standard deviation (SD) obtained from the baseline data of the FranSO cohort, we calculated a Sarcopenia Z-Score according to a recent approach,28 albeit applying the less-stringent EWGSOP definition there. Contrary to the T- or Z-Scores in osteoporosis research, negative Z-Scores were favorable, and reducing the Sarcopenia Z-Score decreases the corresponding risk. Using strata of 5 years, 100 participants were randomly assigned to three study arms: 1) WB-EMS&P, 2) Protein and 3) CG by a uniform allocation rate of 1:1:1 (Figure 1). For the allocation, lots were drawn by the participants themselves. Each of the lots was put in opaque plastic shells (“kinder egg”; Ferrero, Alba, Italy) and drawn from a bowl. Of importance, neither participants nor researchers knew the allocation beforehand. Subsequently, the primary assessment investigator responsible for the randomization procedure (AW) enrolled participants and instructed them in detail about their status including corresponding dos and don’ts. Although blinding to protein (vs placebo) supplementation would have been possible, we conducted a blinded approach with respect to the assessments only. Research assistants/outcome assessors were unaware of participants’ group status (WB-EMS&P, Protein or CG) and were not allowed to ask. All participants who were randomly allocated were included in the primary (intention to treat, ITT) analysis independent of compliance or lost to follow-up. R statistics software29 was used in combination with multiple imputation by Amelia II.30 The full data set was used for multiple imputation, with imputation being repeated 100 times. Over-imputation diagnostic plots confirmed that the multiple imputation worked well in all cases. Based on a statistically (Shapiro–Wilkes test) and graphically (QQ and box plots) checked normal distribution of the primary and secondary outcomes presented in this study, dependent t-tests were used to analyze within-group changes. One-way ANOVA was applied to determine differences between the groups. We used the approach of Alison31 to combine the results of the imputed datasets. In case of relevant (ANOVA) differences, pairwise multiple imputation t-test comparisons with pooled SD were conducted.32 The P-values obtained in the pairwise comparisons were adjusted for multiple testing by the method of Holm.33 All tests were two tailed, and significance was accepted at P≤0.05 or adjusted P<0.05 respectively. Table 1 lists the baseline characteristics of the participants of the FranSO study. No relevant differences were observed. About 80% of each group suffered from two or more diseases. A total of 30 participants reported knee or hip arthrosis and 23 reported frequent or chronic (n=3) dorsal pain, with no relevant difference between the groups (P≤0.556). Notes: a(Soft) lean body mass. bAs determined by BIA (InBody 770, Seoul, Korea). cAccording to the Foundation of the National Institutes of Health.17 dAccording to the EWGSOP. eAs determined over a 10-m track.18 fLate Life Function and Disability Instrument25 (scale from  “no problem” to  “impossible”). gScale from (1) very low to (7) very high.24 hAs determined by a 4-day dietary record. Abbreviations: BIA, bioelectrical impedance analysis; CG, control group; CHO, carbohydrates; EWGSOP, European Working Group on Sarcopenia in Older People; FNIH, Foundation of the National Institutes of Health; FranSO, Franconian Sarcopenic Obesity; LBM, (soft) lean body mass; LLFDI, late life function and disability instrument; MV, mean value; SD, standard deviation; WB-EMS&P, whole-body electromyostimulation and protein supplementation. Figure 1 shows the participant flow through the trial. 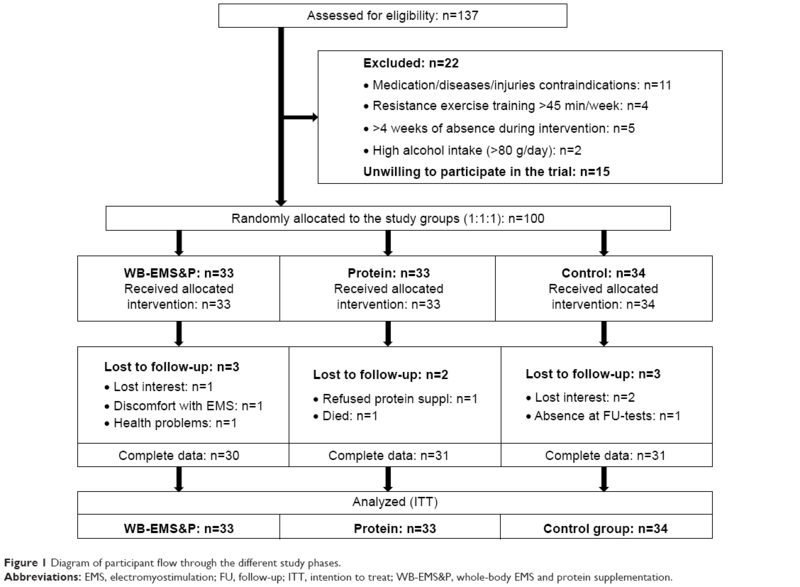 Of the 100 men included, eight subjects were lost to follow-up, two gave study-related reasons (discomfort with WB-EMS, aversion to protein supplementation) for their withdrawal. Attendance rate for WB-EMS was excellent (91%±7%). Compliance with the applied WB-EMS protocol with respect to “strain intensity” was estimated using the subjects’ RPE after 4, 6, 12 and 16 weeks. RPE was quite stable during the intervention and averaged 6.8±0.3 representing a condition of very hard. Compliance with protein intake was determined by checking our list and by applying a questionnaire where participants have to rate their compliance with the protein protocol. Based on these results, we observed a lower protein intake than prescribed in both protein-supplemented groups (WB-EMS: 43.5±23.3 vs 47.7±26.1 g/day P=0.119 and Protein: 51.2±21.4 vs 58.5±22.6 g/day; P=0.001). However, due to the increased dietary protein intake in both verum groups listed in the following section, total protein intake at baseline and follow-up averaged around 1.78±0.09 g/kg per day. Correspondingly, with two exceptions in the WB-EMS&P group (1.59 and 1.65 g/kg per day), all the participants achieved the prescribed protein intake of 1.7–1.8 g/kg body mass per day. With respect to safety aspects, no injuries or adverse effects were observed or reported by the participants during the interventional periods. Table 2 gives the result of the primary outcome “changes of Sarcopenia Z-Score” in the three study groups. Based on comparable baseline data (P=0.566), the Z-Score improved significantly in the WB-EMS&P (P<0.001) and Protein groups (P=0.007) and was maintained in the CG (P=0.61). Both changes in the WB-EMS&P (P<0.001) and the Protein groups (P=0.039) differed from the CG, while changes of the WB-EMS&P were significantly more favorable (P=0.039) compared with the protein-only intervention. In summary, we have to reject our primary hypothesis that WB-EMS but not protein supplementation (WB-EMS&P) significantly affects the FNIH-based Sarcopenia Z-Score compared with a non-training, nonprotein-supplemented control. Abbreviations: CG, control group; CI, confidence interval; FNIH, Foundation of the National Institutes of Health; MV, mean value; ns, nonsignificant; WB-EMS&P, whole-body electromyostimulation and protein supplementation. Table 3 presents the results of the secondary study end points and parameters (SMI, grip strength) constituting the Sarcopenia Z-Score according to FNIH.17 At baseline, relevant group differences (P≥0.730) were observed for none of the parameters. With respect to sarcopenia, morphometric sarcopenic aspects were more affected by the interventions compared with functional aspects (Table 3). SMI increased significantly after the WB-EMS&P (P<0.001) and Protein (P<0.047) intervention and decreased significantly in the CG (P=0.033). Both verum groups differed significantly from control (WB-EMS&P: P<0.001; Protein: P=0.009) with borderline nonsignificant differences between WB-EMS&P and Protein (P=0.055). Thus, we confirmed our hypothesis that WB-EMS&P “and” isolated protein supplementation significantly affected skeletal muscle mass compared with a non-training, nonprotein-supplemented control. Abbreviations: ASMM, appendicular skeletal muscle mass; BMI, body mass index; CG, control group; CI, confidence interval; MV, mean value; ns, nonsignificant; SMI, skeletal muscle mass index; WB-EMS&P, whole-body electromyostimulation and protein supplementation. Grip strength increased significantly in the WB-EMS&P (P<0.001) and borderline nonsignificantly in the Protein groups (P=0.059), while slight positive changes (P=0.63) were observed in the CG. Applying pairwise comparisons, the difference between WB-EMS&P and CG was borderline nonsignificant (P=0.050), while no other between-group variations (P≥0.17) were determined. Total body fat rate decreased significantly in both intervention groups (P<0.001) and increased slightly in the CG (P=0.35). Both, the WB-EMS&P- and the Protein group differed significantly from CG (P≤0.004). The difference between body fat changes in the WB-EMS&P and Protein groups was borderline nonsignificant (P=0.051). Summing up, we thus confirmed our secondary hypothesis that WB-EMS&P “and” isolated protein supplementation significantly affected “total body fat rate” compared with a non-training, nonprotein-supplemented control. At follow-up, participants reported no changes of lifestyle, including physical activity, diseases and medication during the study period. Follow-up nutritional analysis demonstrated no significant changes (P≥0.270) or between-group differences (P≥0.606) for energy intake (WB-EMS&P: 17±375 vs Protein: 88±330 vs CG: 23±385 kcal), CHO (WB-EMS&P: 6±356 vs Protein: 4±53 vs CG: −1±63 g), fat (−1±26 vs 4±19 vs −2±20 g) or alcohol (−1±13 vs 1±16 vs ±0±12 g) intake. However, borderline (non)significant differences (P=0.056) along with a significant increase (P=0.001) in dietary protein intake in the Protein group were observed (WB-EMS&P: 3±17 vs Protein: 9±12 vs CG: −1±16 g) compensating the lower-than-prescribed (as given earlier) protein supplementation in the verum groups (WB-EMS&P: −4±11 vs Protein: −7±11 g). The key result of the study was that both WB-EMS&P and isolated whey protein supplementation significantly affected sarcopenia “and” obesity parameters in community-dwelling men aged 70 years and older. Of importance, however, the effects on Sarcopenia Z-Score and total body fat were (borderline) significantly more pronounced after combined WB-EMS&P. Comparable with other WB-EMS studies with a similar protocol, the effects of WB-EMS28,34 were considerably higher for morphometric compared with dyna(mo)penic/functional parameters. This result can be largely attributed to our EMS approach that focused on low voluntary effort/low orthopedic strain during moderate-to-high impulse intensity, specifically adjusted to this older, less sportive cohort with orthopedic limitations (Table 1). However, in summary, the effect of WB-EMS&P ranged within our expectations. Our data confirmed the results of the FORMOsA study with CDW women aged 70+ years with SO,28 that reported similar effects on sarcopenia parameters. However, unlike most of our WB-EMS studies21,22,35,36 and the current trial, the FORMOsA study failed to generate a significant reduction in body fat. 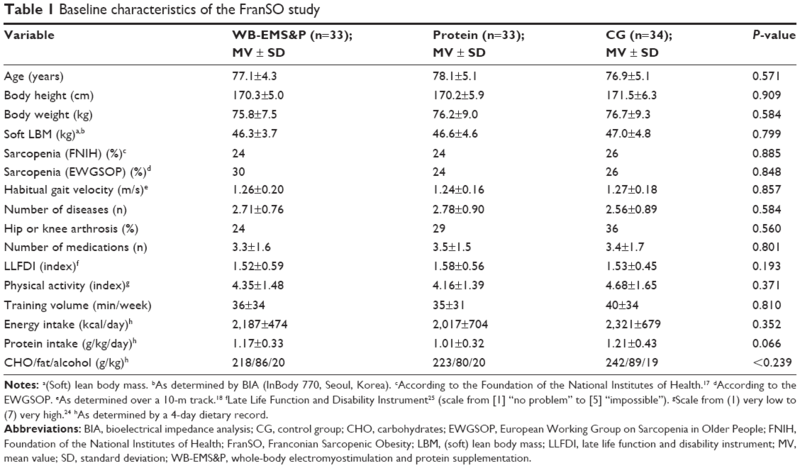 One may argue that the higher WB-EMS volume and intensity along with the higher total protein intake (1.2–1.4 vs 1.7–1.8 g/kg body mass per day) of the FranSO study might explain the varying result, but if that were the case then this pattern should have impacted muscle parameters even more. As that may be, due to the dominating role of obesity within the “cross talk” of adipose tissue and skeletal muscle inflammation,2 the reduction in fat mass may also be a key aspect in the therapy for sarcopenia. Apart from the musculoskeletal burden of sarcopenia and SO, there is an ongoing debate on the cardiometabolic impact of sarcopenia and SO.44–46 Perna et al45 who compared people aged 65+ years without and with sarcopenia or SO confirmed the worse metabolic and inflammatory status of the latter cohorts in general, however, with a better metabolic profile of the SO compared with the sarcopenia patients. Because we do not focus on the effects of WB-EMS47 and/or protein supplementation48 on cardiometabolic risk factors in this article, we refrain here from a deeper discussion of this important topic. To allow the reader to reflect on the results of the current study, we would like to address some limitations and specific features of the FranSO study. 1) The main limitation of the study was the inability to include enough subjects with sarcopenia according to recognized definitions.17,18,26,27 Although this does not excuse our failure, we are not aware of any other exercise or protein/EAA study that fully respects the recognized criteria and cutoff points38 for sarcopenia. 2) We used direct-segmental, multifrequency BIA to determine body composition. However, the FNIH criteria of SMI are based on “dual-energy X-ray absorptiometry” (DXA) assessments. Some authors49,50 reported a systematic overestimation of SMI by BIA compared with the gold standard “DXA,” while others51 and we28,52 observed a good–excellent agreement between both methods. While a potential overestimation of muscle mass by BIA might have aggravated our recruitment, it did not affect the outcome of this study. 3) We applied a rather conventional WB-EMS protocol. After increasing the duration to 20 min, we focused exclusively on adequate (impulse) intensity. Thus, the main difference between FranSO and commercially practiced WB-EMS protocols is the slightly higher training frequency of 1.5 vs 1 session per week. 4) The favorable effect of additional protein supplementation to augment the hypertrophic response to resistance exercise in older adults has not been consistently determined.53–55 However, recent evidence suggests14,15,56 that higher levels of protein intake overcome the lack of muscle responsiveness to low-dosed protein intake in older adults. This “anabolic resistance” provided support for our strategy of combining WB-EMS and whey protein supplements above the current recommendations for older adults (ie, 1.2–1.6 g/kg per day)14,15 while considering the additional requirements of exercise-induced repair and adaptation processes.57 5) We did not supply CHO to generate a placebo effect or to ensure “isocaloric conditions”. While amino acids and protein are essential for anabolic processes, their significance on energy metabolism during energy balance in healthy adults is minor.58 Further, considering the protein-induced thermogenesis and decreased energy efficiency,59 supplying the same amount of CHO and proteins60–62 might generate a significant bias. Indeed, in contrast to FranSO, none of the corresponding studies reported significant reductions in body fat after protein supplementation. Due to the specific nature of sarcopenia and SO,63 which includes aspects of inflammation,2,64,65 mitochondrial abnormalities,66 oxidative stress67 and other factors that may decrease muscle response to exercise, it is debatable whether results evaluated in healthy older adults can be simply generalized to sarcopenic or SO cohorts. This suggests, however, that future studies should compare the effect of dedicated exercise programs in older cohorts with and without sarcopenia and SO to allow a generalization of the bulk of existing data to the field of sarcopenic/SO cohorts. WB-EMS and/or whey protein supplements significantly affected sarcopenia and SO in CDW men aged 70+ years with SO. Due to the aspect that WB-EMS should be considered as an option for people unable or unmotivated to exercise conventionally, a corresponding comparison of effectiveness may be regarded as superfluous. However, similar to a previously reported WB-EMS study that directly compared WB-EMS with an equally time-effective high intensity resistance training protocol resistance protocol,35 the WB-EMS-induced effect on muscle and fat mass on average fell within the range of conventional resistance exercise.6,68 In summary, WB-EMS&P can be considered as an effective, time saving, joint-friendly and low-threshold intervention to fight both, sarcopenia and obesity in older people at risk. The authors would like to express their thanks for the support from the nonprofit organization and health sport club “Netzwerk Knochengesundheit e.V.”, which funded the project. Stenholm S, Harris TB, Rantanen T, Visser M, Kritchevsky SB, Ferrucci L. Sarcopenic obesity: definition, cause and consequences. Curr Opin Clin Nutr Metab Care. 2008;11(6):693–700. Kalinkovich A, Livshits G. Sarcopenic obesity or obese sarcopenia: a cross talk between age-associated adipose tissue and skeletal muscle inflammation as a main mechanism of the pathogenesis. Ageing Res Rev. 2017;35:200–221. Malafarina V, Uriz-Otano F, Iniesta R, Gil-Guerrero L. Sarcopenia in the elderly: diagnosis, physiopathology and treatment. Maturitas. 2012;71(2):109–114. Zamboni M, Mazzali G, Fantin F, Rossi A, Di Francesco V. Sarcopenic obesity: a new category of obesity in the elderly. Nutr Metab Cardiovasc Dis. 2008;18(5):388–395. Strasser B, Schobersberger W. Evidence for resistance training as a treatment therapy in obesity. J Obes. 2011. Article ID 482564. Goisser S, Kemmler W, Porzel S, et al. Sarcopenic obesity and complex interventions with nutrition and exercise in community-dwelling older persons – a narrative review. Clin Interv Aging. 2015;10:1267–1282. Statistisches-Bundesamt. Gesundheit in Deutschland [Health in Germany]. Berlin: Federal Health Report; 2006. German. Rodrigues IB, Armstrong JJ, Adachi JD, MacDermid JC. Facilitators and barriers to exercise adherence in patients with osteopenia and osteoporosis: a systematic review. Osteoporos Int. 2017;28(3): 735–745. Rütten A, Abu-Omar K, Meierjürgen R, et al. Was bewegt die Nicht-Beweger? [What moves the nonmovers?]. Präv Gesundheitsf. 2009;4:245–250. German. Bauer J, Biolo G, Cederholm T, et al. Evidence-based recommendations for optimal dietary protein intake in older people: a position paper from the PROT-AGE Study Group. J Am Med Dir Assoc. 2013;14(8):542–559. Lancha AH Jr, Zanella R Jr, Tanabe SG, Andriamihaja M, Blachier F. Dietary protein supplementation in the elderly for limiting muscle mass loss. Amino Acids. 2017;49(1):33–47. Kemmler W, Teschler M, Weissenfels A, et al. Prevalence of Sarcopenia and Sarcopenic Obesity in community-dwelling German men 70+ using various established definitions. Osteoporos Int. Epub 2017 Feb 20. Bouchard DR, Dionne IJ, Brochu M. Sarcopenic/obesity and physical capacity in older men and women: data from the Nutrition as a Determinant of Successful Aging (NuAge)-the Quebec longitudinal Study. Obesity (Silver Spring). 2009;17(11):2082–2088. Baumgartner RN. Body composition in healthy aging. Ann N Y Acad Sci. 2000;904:437–448. Kemmler W, Schliffka R, Mayhew JL, et al. Effects of whole-body-electromyostimulation on resting metabolic rate, anthropometric and neuromuscular parameters in the elderly. The Training and ElectroStimulation Trial (TEST). J Strength Cond Res. 2010;24(7):1880–1886. Kemmler W, Birlauf A, von Stengel S. Einfluss von Ganzkörper-Elektromyostimulation auf das Metabolische Syndrom bei älteren Männern mit metabolischem Syndrom. [Effects of Whole-Body-Electromyostimulation on Body Composition and Cardiac Risk Factors in Elderly Men with the Metabolic Syndrome. The TEST-II Study]. Dtsch Z Sportmed. 2010;61(5):117–123. German. Kemmler W, Weineck J, Kalender WA, et al. The effect of habitual physical activity, non-athletic exercise, muscle strength, and VO2max on bone mineral density is rather low in early postmenopausal osteopenic women. J Musculoskelet Neuronal Interact. 2004;4(3):325–334. McAuley E, Konopack JF, Motl RW, Rosengren K, Morris KS. Measuring disability and function in older women: psychometric properties of the late-life function and disability instrument. J Gerontol A Biol Sci Med Sci. 2005;60(7):901–909. Kemmler W, Teschler M, Weissenfels A, et al. Whole-body electromyostimulation to fight sarcopenic obesity in community-dwelling older women at risk. Results of the Randomized Controlled FORMOsA-Sarcopenic Obesity Study. Osteoporos Int. 2016;27(10):3261–3270. Team RC [homepage on the Internet]. R. A Language and Environment for Statistical Computing. Vienna, Austria: R Foundation for Statistical Computing; 2017. Available from: https://www.R-project.org/. Accessed June 2, 2017. Honaker J, King G, Blackwell M. Amelia II: a program for missing data. J Stat Software. 2011;45(7):1–47. Alison P. Missing Data. Thousand Oaks: SAGE Publication; 2002. Barnard J, Rubin DB. Small-sample degrees of freedom with multiple imputation. Biometrika. 1999;86(4):948–955. Holm S. A simple sequentially rejective multiple test procedure. Scand J Stat. 1979;6(1):65–70. Kemmler W, Bebenek M, Engelke K, von Stengel S. Impact of whole-body electromyostimulation on body composition in elderly women at risk for sarcopenia: the Training and ElectroStimulation Trial (TEST-III). Age (Dordr). 2014;36(1):395–406. Kemmler W, Teschler M, Weissenfels A, et al. Effects of whole-body electromyostimulation versus high-intensity resistance exercise on body composition and strength: a randomized controlled study. Evid Based Complement Alternat Med. 2016;2016:9236809. Kemmler W, Engelke K, Von Stengel S. Einfluss von Ganzkörper-Elektromyostimulation auf das Metabolische Syndrom bei älteren Männern mit metabolischem Syndrom. [Effects of Whole-Body-Electromyostimulation on Body Composition and Cardiac Risk Factors in Elderly Men with the Metabolic Syndrome. The TEST-II Study]. Dtsch Z Sportmed. 2012;63(12):16–23. German. Komar B, Schwingshackl L, Hoffmann G. Effects of leucine-rich protein supplements on anthropometric parameter and muscle strength in the elderly: a systematic review and meta-analysis. J Nutr Health Aging. 2015;19(4):437–446. Malafarina V, Uriz-Otano F, Iniesta R, Gil-Guerrero L. Effectiveness of nutritional supplementation on muscle mass in treatment of sarcopenia in old age: a systematic review. J Am Med Dir Assoc. 2013;14(1) :10–17. Xu ZR, Tan ZJ, Zhang Q, Gui QF, Yang YM. Clinical effectiveness of protein and amino acid supplementation on building muscle mass in elderly people: a meta-analysis. PLoS One. 2014;9(9):e109141. Xu ZR, Tan ZJ, Zhang Q, Gui QF, Yang YM. The effectiveness of leucine on muscle protein synthesis, lean body mass and leg lean mass accretion in older people: a systematic review and meta-analysis. Br J Nutr. 2015;113(1):25–34. Zhu K, Kerr DA, Meng X, et al. Two-year whey protein supplementation did not enhance muscle mass and physical function in well-nourished healthy older postmenopausal women. J Nutr. 2015;145(11):2520–2526. Baumgartner RN, Wayne SJ, Waters DL, Janssen I, Gallagher D, Morley JE. Sarcopenic obesity predicts instrumental activities of daily living disability in the elderly. Obes Res. 2004;12(12):1995–2004. Perna S, Peroni G, Faliva MA, et al. Sarcopenia and sarcopenic obesity in comparison: prevalence, metabolic profile, and key differences. A cross-sectional study in Italian hospitalized elderly. Aging Clin Exp Res. Epub 2017 Feb 23. Stephen WC, Janssen I. Sarcopenic-obesity and cardiovascular disease risk in the elderly. J Nutr Health Aging. 2009;13(5):460–466. Wittmann K, Sieber C, von Stengel S, et al. Impact of whole body electromyostimulation on cardiometabolic risk factors in older women with sarcopenic obesity: the randomized controlled FORMOsA-sarcopenic obesity study. Clin Interv Aging. 2016;11:1697–1706. Pal S, Radavelli-Bagatini S. The effects of whey protein on cardiometabolic risk factors. Obes Rev. 2013;14(4):324–343. Beaudart C, Reginster JY, Slomian J, et al. Estimation of sarcopenia prevalence using various assessment tools. Exp Gerontol. 2015;61:31–37. Buckinx F, Reginster JY, Dardenne N, et al. Concordance between muscle mass assessed by bioelectrical impedance analysis and by dual energy X-ray absorptiometry: a cross-sectional study. BMC Musculoskelet Disord. 2015;16:60. Ling CH, de Craen AJ, Slagboom PE, et al. Accuracy of direct segmental multi-frequency bioimpedance analysis in the assessment of total body and segmental body composition in middle-aged adult population. Clin Nutr. 2011;30(5):610–615. von Stengel S, Kemmler W, Engelke K. Validität von BIA im Vergleich zur DXA bei der Erfassung der Körperzusammensetzung. [Validity of Bioelectrical Impedance Analysis (BIA) compared with Dual Energy x-Ray Absorptiometry (DXA) to determine body composition]. Dtsch Z Sportmed. 2013;62(7/8):200. German. Cermak NM, Res PT, de Groot LC, Saris WH, van Loon LJ. Protein supplementation augments the adaptive response of skeletal muscle to resistance-type exercise training: a meta-analysis. Am J Clin Nutr. 2012;96(6):1454–1464. Finger D, Goltz FR, Umpierre D, Meyer E, Rosa LH, Schneider CD. Effects of protein supplementation in older adults undergoing resistance training: a systematic review and meta-analysis. Sports Med. 2015;45(2):245–255. Thomas DK, Quinn MA, Saunders DH, et al. Protein supplementation does not significantly augment the effects of resistance exercise training in older adults: a systematic review. J Am Med Dir Assoc. 2016;17(10):.e1–.e9. Baum JI, Kim IY, Wolfe RR. Protein consumption and the elderly: what is the optimal level of intake? Nutrients. 2016;8(6):E359. Tipton KD. Protein for adaptation to exercise training. Eur J Sport Sci. 2008;8(2):107–118. Melzer K. Carbohydrate and fat utilization during rest and physical activity. ESPEN. 2011;6:e45–e52. Westerterp-Plantenga MS. Protein intake and energy balance. Regul Pept. 2008;149(1–3):67–69. Cribb PJ, Williams AD, Stathis CG, Carey MF, Hayes A. Effects of whey isolate, creatine, and resistance training on muscle hypertrophy. Med Sci Sports Exerc. 2007;39(2):298–307. Mielke M, HOUSH TJ, Malek MH, et al. The effects of whey protein and leucine supplementation on strength, muscular endurance, and body composition during resistance training. J Exercise Physiol Online. 2009;12(5):39–50. Willoughby DS, Stout JR, Wilborn CD. Effects of resistance training and protein plus amino acid supplementation on muscle anabolism, mass, and strength. Amino Acids. 2007;32(4):467–477. Kob R, Bollheimer LC, Bertsch T, et al. Sarcopenic obesity: molecular clues to a better understanding of its pathogenesis? Biogerontology. 2015;16(1):15–29. Calvani R, Joseph AM, Adhihetty PJ, et al. Mitochondrial pathways in sarcopenia of aging and disuse muscle atrophy. Biol Chem. 2013;394(3):393–414. Sullivan-Gunn MJ, Lewandowski PA. Elevated hydrogen peroxide and decreased catalase and glutathione peroxidase protection are associated with aging sarcopenia. BMC Geriatr. 2013;13:104. Borde R, Hortobagyi T, Granacher U. Dose-response relationships of resistance training in healthy old adults: a systematic review and meta-analysis. Sports Med. 2015;45(12):1693–1720.